Ernest Hemingway wrote the short story "In Another Country" in the style which some critics named as a detachment-style. It means that the author's purpose was to show life as it was, the main character just described what he saw around him. 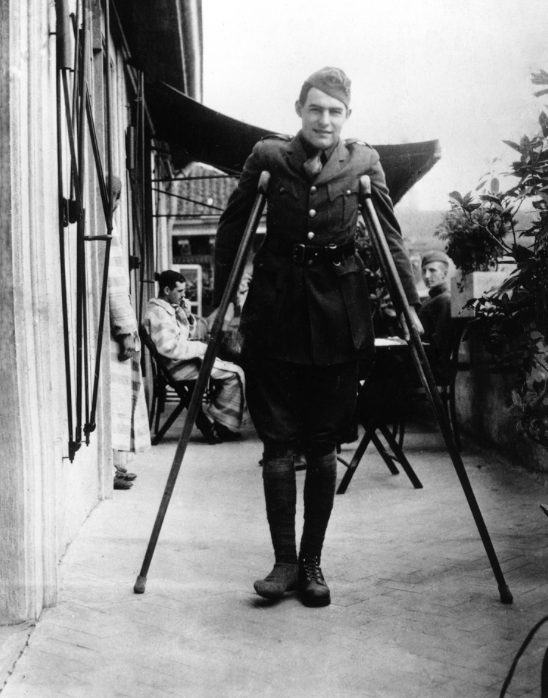 The story was told from the side of the wounded American soldier who was in an Italian hospital. Ernest Hemingway was wounded in Europe during the First World War, the story could be defined as an autobiographical story. The first line expressed the mood of the narrative, it displayed a smooth tone and the measured the peaceful life. It was written, "In the fall the war was always there, but we did not go to it any more. It was cold in the fall in Milan and the dark came very early." The doctor asked him about sports that he practiced before. It was football and the doctor replied, "You will be able to play football again better than ever". "I was a friend, but I was never really one of them after they had read the citations, because it had been different with them and they had done very different things to get their medals." So the three boys and the author drifted apart. The narrator stayed good friends with the boy who had been wounded his first day at the front. This boy could never be accepted either and the author felt more comfortable with him. The narrator spent much time with another patient; the major whose hand was severely wounded. The major dedicated his time to correcting the grammar of the Italian language which the author was studying. He had complimented the narrator on how he spoke Italian. The narrator mentioned that Italian seemed so easy to speak that he was not interested in it. The major replied, "Why, then, do you not take up the use of grammar?”. After that, the language became so difficult for the narrator that he was afraid to speak with the major until he had learned the grammar. When the author didn't spend enough time studying grammar, the major said that he, "was a stupid impossible disgrace, and he was a fool to have bothered with me". Once the major asked the author if he was going to marry. The major seemed very angry, he repeated, “A man must not marry....He'll lose it,” he almost shouted, “Don't argue with me!”. "I am so sorry,” he said, and patted me on the shoulder with his good hand. “I would not be rude. My wife has just died. You must forgive me"
Ernest Hemingway chose for this story a detached, objective tone and attitude toward the subject. This literary method gives readers possibilities to see the time how it was, like watching the documentary. The author was able to recreate his time and to deliver the atmosphere of the place for us.